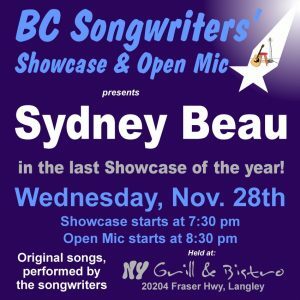 This Wednesday, November 28th, our Songwriter Showcase features Sydney Beau, starting at 7:30 pm. We hope there will be a good turnout, as Sydney is an amazing singer/songwriter, and this is the last Showcase of the year… so we’d like to give away lots of Christmas hugs, to everyone enjoying an awesome show! At 8:30, it is time for those who sign up for open mic to share an original song or two. At 9:30, we be saying ‘good night’, with the warmest wishes for a safe holiday season, filled with all the love you could hope for! 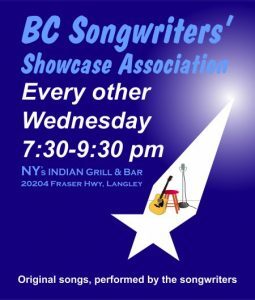 It all happens at NY Grill & Bistro – 20204 Fraser Hwy, Langley. We hope to see you there!